Talk about a fun card to make! We have sunshine and blue skies so what could be more perfect than to create a bright, beautiful butterfly card. I've finally dug out my stencils and modeling paste and have been adding more dimensional to my designs. While this stencil is called Mini Bubbles, I thought it made a lovely flower for this butterfly to hover over. The purple, mint green, hot pink and teal colors from the Color Throwdown Challenge all blended together well and made for a very nice background for the stenciled imaged. One thing I have found using the Clarity Stencil Brushes, is that the colors are always much lighter and a bit softer then they really are. The colors I used for the background are Perfect Plum for the purple, Mint Macaron for the mint, Melon Mambo for the hot pink and Bermuda Bay for the teal. The butterfly was stamped using Strawberry Shortcake from Taylored Expressions. When I tried it with the Melon Mambo, it came out way too dark. Believe when I say, this butterfly is much prettier than the other one. The colors I used are from the Color Throwdown Challenge. They are fantastic colors and I had fun creating the background using my Clarity Stencil Brushes and adding some Modeling Paste. Wow! Marsha, this card is gorgeous! It is so eye-catching! Love it! Thanks, Lucie! It was fun to create. I LOVE that beautiful softly colored background! 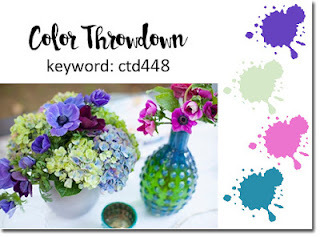 Thanks so much for joining us this week at the Color Throwdown!